The Dark, Strong and Full-Bodied Peaberry Robusta Whole Bean Coffee You Love! Imagine a hot cup of coffee waiting for you on a long tiring day or get you all excited to have that energy boost to prepare you to face the daily work grind? A Peaberry Robusta coffee bean is your perfect getaway when you long for a great coffee experience and your engine key to jump start your body. 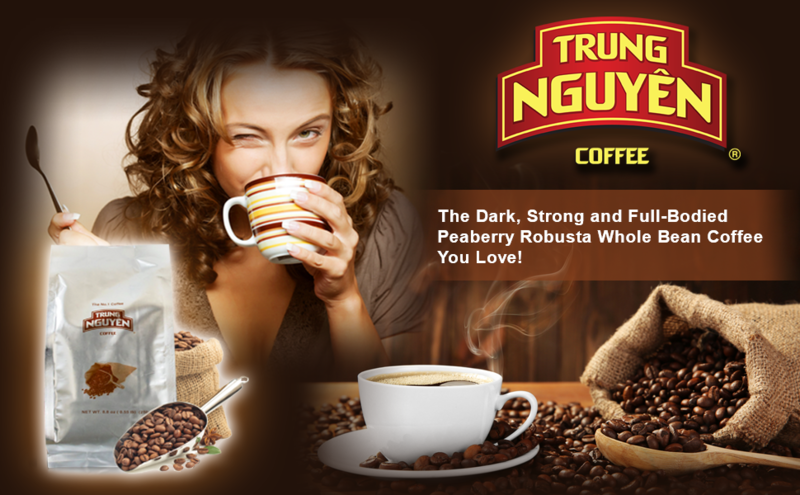 For years, Trung Nguyen (TN) Whole Bean Coffee has been delivering the finest coffee treat every coffee lover prefer. There are a thousand types of coffee. But, ONLY one is the Purest, most Delicious, and dedicated to be Creative. This can ONLY be found in TRUNG NGUYÊN! The product is a combination of round Robusta bean. It has a light aroma and bittersweet taste. Best taste when drinking hot and drinking with milk. Trung Nguyen Culi Robusta Coffee Beans is a medium roast whole bean coffee that offers full body flavor with superior aroma and chocolatey taste. Grown in Vietnam, it is one of the best coffee beans whole that is stable and resists oxidation, creating a longer shelf life and fresh flavor. Our whole coffee beans is perfect for those who find joy in grinding their own coffee and brewing for that ultimate coffee experience. Have yourself a merry Robusta coffee today! Perfect Blend of Creamy and Dark Robusta Coffee! It has never failed to please anyone’s palate for that strong and bold coffee taste with creamy and chocolate taste from the long ripening process. INGREDIENTS: Coffee Robusta, Butter oil substitute, Coffee and chocolate flavours. Crafted to be gentle in the stomach, the TN Robusta Coffee is has low acidity that does not raise acid levels in the stomach that causes hyperacidity. 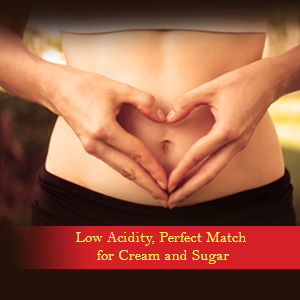 Enjoy perfect Robusta coffe without worrying about your tummy! If you are more than a black coffee drinker and love cream and sugar over your coffee, the TN Robusta Coffee Bean Whole raises the bar for creamy and rich coffee to die for! 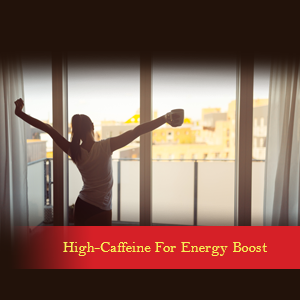 Have an instant shot of energy that lingers throughout the day with TN Robusta Coffee Beans Whole. It has high-caffeine content compared to Arabica without tasting burnt. Recharge your body and mind with a cup of this robusta coffee bean sampler and increase your productivity like ever. The TN Robusta Whole Bean Coffee is very special because of its Peaberry nature. It has a natural sweet flavor and has richer taste compared to standard coffee beans (flat beans). 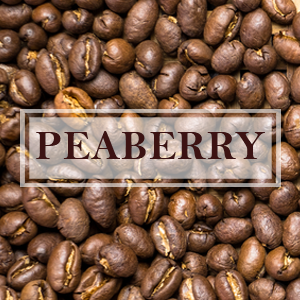 A peaberry, known in Spanish as Caracolillo, comes from the coffee plant fruit called “cherry”. Normally the fruit has 2 seeds (beans) that grows flat facing each other. On rare occasions, one seed flattens while the other seed mutates. The mutated seed is then then the peaberry bean. Only 5% of all coffee beans that are harvested has this peculiar mutation. This is why peaberry coffee is very rare. The TN Robusta Whole Coffee Bean has a medium roasting point, low acidity, full body, rich flavor and aftertaste. As one of the important origins of coffee in the world, Vietnam is hailed to be the second world’s producer of coffee. 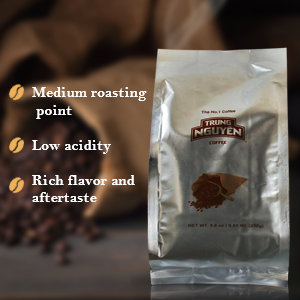 Trung Nguyen whole coffee beans are cultivated in the rich mountainous regions of Vietnam with high altitudes that are an incredible source of different coffee species. Slowly roasted using traditional “home-style” methods, the TN Robusta coffee no doubt delivers that best coffee encounter! The TN Robusta Whole Coffee Bean is best prepared with the help of your favorite coffee grinder and brewing mastery. Grind coffee beans before preparing. (Not use for Espresso Machine). Grind your TN Robusta Whole Coffee Bean using your favorite coffee grinder. A manual or an electric grinder will do. For drip machines, use one (1) leveled tablespoon of the ground Robusta coffee, add more to your taste. 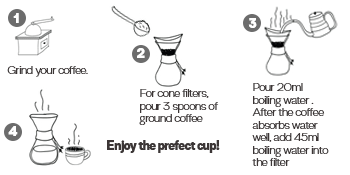 Alternatively, for cone filters, use three (3) spoons of ground coffee (20g) into the filter. Gently shake and press the cap inside. Pour 20m I boiling water (about 96-1 OO°C) into the filter. After the coffee absorbs water well, add 45ml boiling water into the filter. Trung Nguyen Coffee is widely known for its authentic Vietnamese coffee that has a rich history of development since the 1700s. It offers heirloom varieties that deliver more original, broader coffee taste. Every coffee line by Trung Nguyen is remarkably special in terms of plantation, harvest and roasting techniques so we can give you the best coffee you deserve. 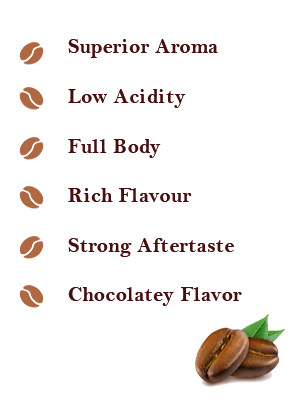 Why Choose Trung Nguyen Robusta Whole Bean Coffee? 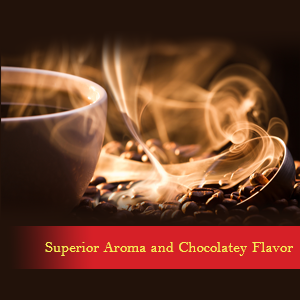 It is medium roast bringing you consistent strong coffee with naturally sweet chocolate flavor. Perfectly matched by cream and sugar. Can be mixed with Arabica coffee and experience a whole new dimension of coffee drinking. Unique serving and brewing methods using Phin Filters and French Press.